implies the conversion of natural to managed ecosystems in order to produce adequate and continual food supply. Demands for an increase in food production were initially met by expanding the area being cultivated or horizontal expansion. The cropland area increased from 265 million hectares (Mha) prior to the Industrial Revolution in 1700 to 1,500 Mha in 1980, representing an increase of 5.7 times in less than three centuries. (One hectare equals 2.47 acres.) The scarcity of new land for crop production necessitated increasing crop production per unit area and time from the same land. This need for agricultural intensification, or vertical expansion, has been satisfied by the use of chemical fertilizers, supplemental irrigation, improved cultivars, and intensive cropping systems. Soil fertility refers to reserves of plant nutrients (e.g., N, P, K, Ca, Mg, Zn, Cu, Mo, S, and B) in the root zone and their availability to cultivated plants in accord with physiological needs. Most ancient civilizations evolved on soils with built-in fertility rejuvenation mechanisms. These included alluvial soils along the floodplains of major rivers (e.g., the Nile, Indus, Euphrates, and Tigris) or loess soils with a continuous source of plant nutrients through wind-blown materials (e.g., the Loess Plateau of China). With an increase in population, agriculture expanded into other regions where the nutrient supply was not renewed on a regular basis by flood water or wind deposits. In regions with adequate water supply, nutrients stored in the forest biomass were released for crop production through the "slash and burn" method. Soil fertility was restored by land rotation or shifting cultivation in which a short cultivation period of two to three years was followed by long fallow or a rest period of fertility restoration. The land was used extensively and productivity was low. In these systems, farms were small and based on mixed farming systems with the close integration of crops with livestock. This involved the incorporation of hay or meadows in the rotation cycle. Crop residues and hay were fed to livestock and manure redistributed on the land. With the wide availability of fertilizers since World War II, farms in North America and other developed economies have become larger, leading to the increased predominance of monoculture and the elimination of hay and meadows from the rotation cycle. Animal production operations have become specialized, based on feedlot, creating a problem of manure management on the one hand and depletion of soil organic carbon (SOC) stock on the other. The use of supplemental nutrients to increase crop yield started as trial and error in the form of wood ashes, ground bones, salt peter, and gypsum. Justus von Liebig (1803–1873), a German chemist, laid the foundation for the use of chemical fertilizers as a source of plant nutrients starting in 1840. He recognized the importance of various mineral elements derived from the soil in plant nutrition and the necessity of replacing those elements in order to maintain soil fertility. Two British scientists, J.B. Lawes and J.H. Gilbert, in turn established the agricultural experiment station at Rothamsted, in the United Kingdom. They built on the work of Liebig and experimentally demonstrated the importance of chemical fertilizers in improving and maintaining soil fertility. In fact, the application of synthetic fertilizers was the basis of the global increase in agricultural production after World War II. Global fertilizer use was merely 27 million tons in 1959 and 1960; it increased five times to 141 million metric tons over the forty-year period ending in 2000. The projected fertilizer demand for the year 2020 is 220 million metric tons. Intensive fertilizer use on input-responsive cultivars grown on prime irrigated land was the basis of the green revolution in South Asia and elsewhere that saved millions from hunger and malnutrition. As the world population increases and cropland becomes more valuable, total cropland acreage is beginning to diminish, increasing the reliance on fertilizer. Similar to fertilizer use, there has also been a rapid increase in global pesticide use. 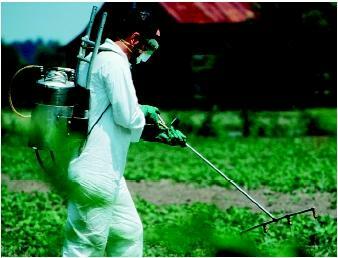 In fact, much of the success of the green revolution depended on the use of pesticides. Global pesticide use was four million tons in 1970, five million tons in 1985, and six million tons in 2001. As much as 85 percent of all pesticides are used in agriculture. The misuse of pesticides can cause severe environmental problems, especially in developing countries. It is estimated that chemical pollution in agriculture costs about $100 billion in diverse public health and environmental damage each year worldwide. The health risks are due to a lack of or inadequate occupational and other safety standards, insufficient enforcement, poor labeling, illiteracy, and insufficient knowledge about the hazards of pesticides and fertilizers. Supplemental irrigation has been used to raise crops in arid regions since 9500 to 8000 B . C . E .Irrigated agriculture developed in the Middle East, South Asia, China, and in Central and South America. Irrigation played a major role in increasing food production during the nineteenth and twentieth centuries. Irrigated land area had expanded to 275 Mha by 1998. Worldwide, 17 percent of irrigated cropland produces 40 percent of the world's food. The leakage of fertilizers into the environment adversely impacts water quality (i.e., nonpoint source pollution) and exacerbates the greenhouse effect (i.e., emission of N 2 O and NO x ). Fertilizer use efficiency can be enhanced by the adoption of conservation tillage and incorporation of cover crops in the rotation cycle. Cover crops include grass species sown between the main crops to improve soil quality and increase the SOC pool, or leguminous crops that enhance soil fertility through biological nitrogen fixation. Species of Graminaceae and Cruciferae are nitrate catch crops and produce biosolids/residues to be used as mulch. Nitrate catch crops minimize the leaching of nitrates available in the soil, and undersown catch crops are more efficient than those established after the harvest of main crops. Inappropriate land use, soil mismanagement (especially the practice of plowing and growing monoculture with the subsequent need for large amounts of pesticides), and the adoption of fertility-mining practices can have adverse impacts on the environment, including the eutrophication of surface water, contamination of ground water, and emission of greenhouse gases (GHGs) from agricultural ecosystems into the atmosphere. Processes that lead to environmental pollution include accelerated erosion, leaching, volatilization, mineralization of organic matter, methanogenesis , and denitrification. These processes are accentuated by the conversion of natural to agricultural ecosystems, biomass burning, plowing and other excessive soil disturbance, indiscriminate use of fertilizers and other farm chemicals such as pesticides and herbicides, and drainage of wetlands. Nonetheless, these activities were deemed necessary to increase agricultural productivity to meet the demands of an increased population during the nineteenth and twentieth centuries. Intensive Commercial Agriculture in Developed Countries. Agricultural pollution in developed countries such as the United States is caused by the excessive use of chemicals. In the United States, the use of synthetic pesticides since 1945 has grown thirty-three-fold to about 0.5 billion kilograms (kg) per year or 3 kg per hectare per year. Further, the increase in hazard is even greater than it might appear because the toxicity of modern pesticides has increased by more than ten-fold over those pesticides used in the early 1950s. U.S. data show that 18 percent of all pesticides and about 90 percent of all fungicides are carcinogenic. In addition to humans, thousands of domestic animals are also poisoned by pesticides in the United States. The destruction of natural predators and parasites is costing the nation more than $500 million each year and resulting in the development of pesticide resistance. Ground and surface water contamination from pesticides is a serous issue. The excessive use of fertilizers and plowing can cause the eutrophication of water and transport sediment-borne chemicals into surface water. The average fertilizer use is about 100 kg per hectare per year in North America and 200 kg per hectare per year in western Europe. If use efficiency is less than 60 percent, a large proportion of the fertilizer applied ends up in surface and ground waters, or as a gaseous emission (N 2 O and NO 2 ) into the atmosphere. Low-Input Agriculture in Developing Countries. The shifting cultivation and related bush-fallow systems, practiced in sub-Saharan Africa and elsewhere in the tropics, rely on cycling nutrients accumulated in vegetation and the soil surface during the fallow period. Deforestation and biomass burning emit large quantities of particulate matter and GHGs into the atmosphere. Further, the mineralization of SOC to release plant-available nutrients (e.g., N, P, K, Ca, Mg, Zn, etc.) gives off CO 2 and other GHGs into the atmosphere. The release of 50 kg of N per hectare through the decomposition of soil organic mater would lead to the emission of 500 kg of CO 2 -C, if we assume a conservative C:N ratio of 10:1. The problem is drastically exacerbated by accelerated soil erosion, which is a widespread problem due to harsh climate and fragile soils. Soil nutrient depletion at a continental scale continues to be a major problem in Africa, with severe economic and environmental consequences. The average annual nutrient loss on arable land in Africa was 22 kg N per hectare, 2.5 kg P per hectare, and 15 kg K per hectare. Intensive Agriculture in Developing Economies. The rapidly growing human population in Asia (particularly in the southern or eastern regions of the continent) has jeopardized the environment and natural resources, which are already under great stress. Consequently, off-farm input (e.g., fertilizers, pesticides, irrigation, plowing) plays an important role in food production in India, China, Thailand, Malaysia, Indonesia, etc. In India, approximately 59 million kg of pesticides are applied to agriculture annually. The average rate of fertilizer application in East Asia is 240 kg per hectare per year. Because of N subsidies, for example, farmers apply the cheap N pesticide and do not consider using the more expensive but less toxic P and K products. Consequently, there is a nutrient mining of soil in intensive rice-wheat areas. Further, highly soluble chemicals are quickly leached into the ground water. India is one of only two countries worldwide (along with the United States) to have applied more than 100,000 tons of dichlorodiphenyl trichloroethane (DDT) since its initial formulation. Because of the excessive and indiscriminate use of pesticides in India, the total intake of organochemicals per person in that country is the highest in the world. Despite the problems outlined here, the adoption of recommended agricultural practices (RMPs) can enhance food production with minimal risks to the environment. In addition to the use of improved varieties responsive to input, RMPs include conservation-till or no-till farming involving cover crops in the rotation cycle, integrated nutrient management based on a judicious use of chemical fertilizers in combination with manures and other biosolids, precision farming to apply nutrient and chemicals based on soil-specific needs, soil-water management through drip irrigation/fertilization, or subirrigation through controlled water table management, etc. The objective is agricultural intensification on existing land. It means cultivating the best soil with the best management practices to produce the optimum sustainable yield and save agriculturally marginal lands for nature conservancy. There are numerous, diverse, and increasing demands on agriculture in the twenty-first century. In addition to meeting the demands for the economic production of food, feed, fiber, and fuel, agriculture of the twenty-first century must also address environmental concerns, especially in regard to water quality and the accelerated greenhouse effect. Soil is a biofilter, and a reduction in the thickness of the topsoil layer through erosion has a direct negative effect on the buffering and filtering capacity of the soil and on the emission of greenhouse gases into the atmosphere. Soil erosion preferentially removes soil organic matter because it is light and is concentrated in the surface layer. A large fraction of the C thus displaced by water runoff may be prone to mineralization, leading to its emission into the atmosphere as CO 2 . It is estimated that globally 1.1 billion tons of C may be emitted annually as CO 2 because of displacement by water erosion. In addition, some of the organic matter deposited in depressional sites and aquatic ecosystems may lead to the emission of methane (CH 4 ) and nitrous oxide (N 2 O). In comparison to CO 2 , the global warming potential is twenty-one for CH 4 and 310 for N 2 O. Sustainable agriculture, therefore, is a viable production system based on environmentally benign agricultural practices. The objective of sustainable agriculture is to enhance and sustain production while improving soil fertility, soil tilth, and soil health. While enhancing production, sustainable agriculture must also address environmental issues with regard to water quality and the greenhouse effect. Rather than being the cause, improved agriculture is a solution to certain environmental problems. Sustainable agriculture implies profitable farming on a continuous basis while preserving the natural resource base. It is not synonymous with low-input, organic, or alternative agriculture. In some cases, low input may sustain profitable and environmentally sound farming. In others, it might not. The addition of organic amendments might enhance soil quality, but may not eliminate the need for the judicious use of fertilizers. Large quantities (10 to 20 ton/hectare/year) of organic manures are needed to supply enough nutrients to produce the desired yields. Therefore, the use of organic manures, although desirable, may not be logistically feasible. In sub-Saharan Africa, low inputs on impoverished soils and low yields have been responsible for low standards of living, severe malnutrition, and widespread problems of soil and environmental degradation. Therefore, the adoption of RMPs is a necessary prerequisite to feeding the earth's expected ten billion inhabitants by the year 2100. Judicious management includes the conversion of marginal agricultural soils to restorative land use and adoption of RMPs. Technological options differ among soils, ecoregions, and social and cultural settings, but the underlying basic principles remain the same. SEE ALSO C ARVER , G EORGE W ASHINGTON ; C RYPTOSPORIDOSIS ; G REEN R EVOLUTION ; I NTEGRATED P EST M ANAGEMENT ; P ESTICIDES . Bumb, B.L., and Baanante, C.A. (1996). "The Role of Fertilizer in Sustaining Food Security and Protecting the Environment to 2020." IFPRI, Food, Agriculture and the Environment Discussion Paper 17, Washington, DC. Evans, L.T. (1998). Feeding the Ten Billion: Plants and Population Growth. Cambridge, UK: Cambridge University Press. FAO. (1996). The Production Yearbook. Rome: Italy. FAO. (1999a). The Production Yearbook. Rome: Italy. FAO. (1999b). "The State of Food and Agriculture." Paper presented at 30th Session of the FAO Conference, November 12–23, 1999, Rome, Italy. FAO. (1999c). "Assessment of the World Food Security Situation." Report CFS: 99/2 presented at the 25th Session of the Committee on World Food Security, May 2–31,1999, Rome, Italy. FAO. (2000). The Production Yearbook. Rome: Italy. Field, W. (1990). "World Irrigation." Irrigation and Drainage Systems 4:91–107. Hyams, E. (1952). Soil And Civilization. London: Thames and Hudson. IFDC. (1979). Fertilizer Manual. Muscle Shoals, AL. IFDC. (1999). Global and Regional Data on Fertilizer Production and Consumption 1961–62 to 1997–98. Muscle Shoals, AL. Jauhar, P.P., and Khush, G.S. (2002). "Importance of Biotechnology in Global Food Security." In Food Security and Environment Quality in the Developing World, edited by R. Lal, D.O. Hansen, N. Uphoff, and S. Slack. Boca Raton, FL: CRC Press, pp. 105–126l. Lal, R. (1995). "Global Soil Erosion by Water and Carbon Dynamics." In Soils and Global Change, edited by R. Lal, J.M. Kimble, E. Levine, and B.A. Stewart. Boca Raton, FL: CRC Press, pp. 131–141. Lal, R. (2002). "Soil and Human Society." In Encyclopedia of Soil Science, edited by R. Ral. New York: Marcel Dekker, pp. 663–666. Lowdermilk, W.C. (1953). Conquest of the Land through 7000 Years. Washington, DC: USDA-SCS. Myers, W.B. (1996). Human Impact on the Earth. Cambridge, UK: Cambridge University Press. Pimentel, D. (1996). "Green Revolution Agriculture and Chemical Hazards." The Science of the Total Environment 188 Supplement: S86–S98. Pimentel, D. (2002). "Agricultural Chemicals and the Environment." In Food Security and Environmental Quality in the Developing World, edited by R. Lal, D.O. Hansen, N. Uphoff, and S. Slack. Boca Raton, FL: CRC/Lewis Publishers, pp. 205–213. Postel, S. (1999). Pillar of Sand: Can the Irrigation Miracle Last? New York: W.W. Norton. Scherr, S. (1999). "Soil Degradation: A Threat to Developing Country's Food Security." IFPRI Discussion Paper 7, Washington, DC. Stoorvogel, J.J., Smaling, E.M.A., and Janssen, B.H. (1993). "Calculating Soil Nutrient Balances in Africa at Different Scales. I. Supra-national Scale." Fertilizer Research 35:227–335. Struever, S. (1971). Prehistoric Agriculture. Garden City, NY. Tandrich, J.P. (2002). "History to Early-Mid 20th Century". In Encyclopedia Of Soil Science, edited by R. Lal. New York: Marcel Dekker, pp. 659–662. Williams, M. (1994). "Forests and Tree Cover." In Changes in Land Use and Land Cover: A Global Perspective, edited by W.B. Meyer and B.L. Turner II. New York: Cambridge University Press, pp. 97–123. CAFOs or Concentrated animal feeding operations pose major environmental risks because of the large quantities of animal waste that they produce. A 10,000-hog CAFO produces as much waste in a single day as a town of 25,000 people. In 1997, a toxic algae called Pfiesteria, linked to manure from giant chicken factories, polluted the waters of the Chesapeake Bay, killed thousands of fish, sickened more than a dozen people, and put the bay's entire seafood industry at risk. Pfiesteria has been implicated in more than 50 percent of the fish kills in North Carolina coastal waters. Organic farming is the raising of crops and products using natural fertilizers and cultural and biological pest management. It excludes the use of synthetic chemicals in crop production and prohibits the use of antibiotics and hormones in livestock production. The U.S. Department of Agriculture (USDA) implemented national organic standards on organic production and processing in October 2002 and products meeting those standards are "certified organic." USDA reports in 2002 that about 1 percent of oats, dry beans, tomatoes, grapes, and citrus were grown organically and about 2 percent of dry peas and lentils, 3 percent of apples, 4 percent of carrots, and 5 percent of lettuce was organic. Raising poultry is big industry on Maryland's Eastern Shore, but there's a problem. The 600 million birds annually create about 800,000 tons of chicken manure. They may soon be creating electricity. Environmentalists, the poultry industry and local officials are enthusiastically studying plans to build a 40-megawatt power plant that would burn chicken manure mixed with wood shavings to generate electricity. Fibrowatt, the British company making the proposal, already operates three poultry-manure-powered generating plants in England and is currently building a plant in Minnesota to be powered by turkey manure.